Ascender is creating original shorts, video essays on film and daily gaming streams. Hey you beautiful people, this is Stephen Ford. I'm the guy who creates all the content for Ascender. You may know me from such shows as MTV's Teen Wolf, or Freeform's Switched At Birth. The dream is that Ascender will become a digital production company that produces original narrative content, opinion pieces on film and awesome gaming videos. It will eventually produce films, television shows, video games and written works. We need your help Obi-Wan Kenobi. For the price of a meal at McDonald's a month, you'll be helping us make original content. While starting a new channel, it's impossible to rely solely on YouTube ad revenue. Especially with the way they like to demonetize videos, so we're turning it over to you. In order to grow, we need monetary support but I don't plan on keeping your money forever. If this whole thing takes off, we'll eventually switch to ad money support and no longer have to depend on your donations. There is no telling when this will happen. It all depends on you, in a way, with more support, we'll be able to produce better content more quickly and switch to ad revenue sooner. When we turn a profit from ad revenue, our hope is that we will begin giving the money back to you, the Patron. You're investing the content, not flashy cars or nights out on the town. Consider your donation an investment, not only into our content which you'll directly be responsible for helping create, but also in receiving digital gifts, from personalized badges for Discord to shoutouts on our videos. There is limited amount of space in the Ascender Patreon. Ensuring the money goes to channel budget and time needed for creating content. Creating a monetary cap increases the likelihood of return on investment. Most importantly, it creates a tight knit family of Ascenders. Even if it's $10 a month, that helps. If just 150 Ascenders chipped in a month to support the channel, we'll be able to produce content full time. Daily Twitch gaming live streams. If you are in a position to and want to directly help support the channel, you can pick the monthly amount that works and even get some rewards in exchange! Currently, the first 50 Patrons (regardless of level) will be the rank of Founder. Once we hit a goal of 50 Patrons, I will be turning off pop up ads on Youtube. Once we hit a goal of 100 Patrons, I will be turning off ads on Twitch. Once we hit a goal of 150 Patrons, I will be turning off all ads on all platforms. I'm currently writing a science fiction novel and this Patreon will also be helping make that a reality. Anyone of the rank of Ascender to Master will receive a free copy of this book when it releases. You're a survivor. You're not going to give up. You're so handsome and scruffy. Slip past the blockade. Deliver the goods. 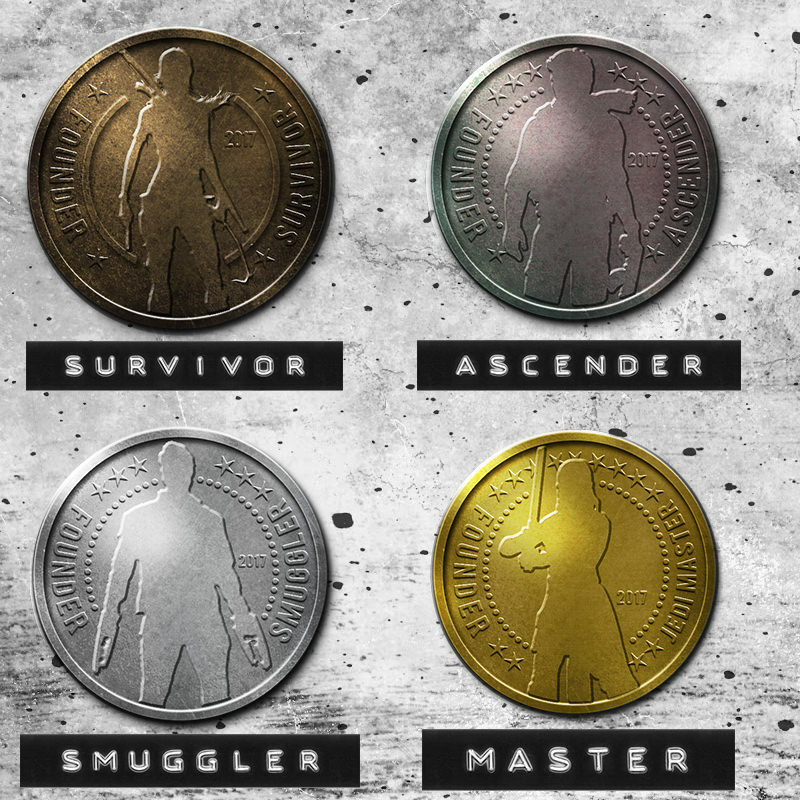 The first 50 Patrons will receive a custom badges/coins with the rank of Founder and their level. After we hit 50 we'll have a game night on Twitch!